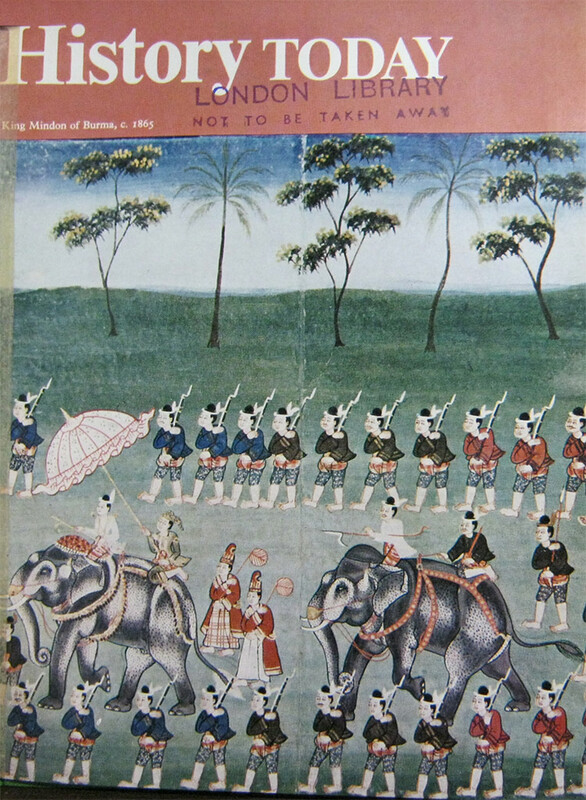 For twenty-five years, King Mindon preserved a peaceful and progressive atmosphere in nineteenth-century Burma. ‘If this Empire seems an evil thing to me, it is not because I hate the British, I hate only the Empire.’ B.G. Gokhale offered an assessment of Gandhi upon the centenary of his birth. A.F. Tilley explains how the Greeks propelled their boats. Kenneth Woodbridge describes the letters of Sir Richard Hoare, Banker, Goldsmith and Lord Mayor of London, to his sons. During the first half of the thirteenth century, Matthew Paris recorded in words and drawings the events of world history. W.N. Bryant tells his story. G.A. Rothrock describes how, at the close of the French Wars of Religion in 1627-8, the Protestant centre of La Rochelle succumbed to royal siege. J.H. Plumb comments on how the famous historian of the Roman Empire, Edward Gibbon, sought a detached and truthful past, free from preconception or the idea of inherent purpose.